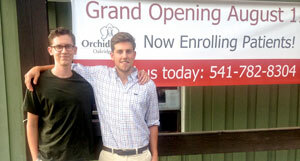 Oliver Alexander, left, and Orion Falvey are Oregon entrepreneurs who opened Orchid Health, a rural clinic in Oakridge, Ore., that provides affordable primary care for anyone who chooses to become a member. Their model has received several awards. Two years ago, two college students with no healthcare background or experience decided to tackle a vexing issue: how to provide primary care to low-income rural residents. What began as their project for a student competition has turned into a reality. 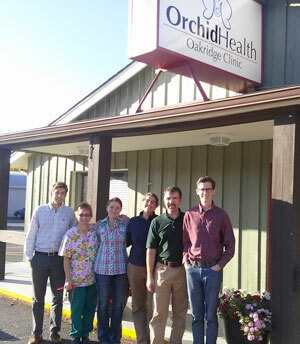 In August, University of Oregon business graduates Oliver Alexander, 22, and Orion Falvey, 24, opened Orchid Health, a for-profit rural clinic offering affordable health care in Oregon’s Lane County. Alexander and Falvey are determined to prove that the thousands of hours they spent researching, developing their model and recruiting providers that share their vision can serve as a model for the rest of the nation and, particularly, for the state of Oregon. Orchid Care Plan offers a monthly membership for anyone who wants to join, regardless of insurance status. These members are then eligible for unlimited primary and preventative care appointments; monthly fees range from $39 to $69 a month, depending on age. Medicare and Medicaid patients are not included in the monthly plan but can still get services there, with those programs billed for their care. Nonmembers with private insurance pay cash for their visits, but then can submit their bills to their insurers. A primary care physician and family nurse practitioner provide primary care and a Qualified Mental Health Professional provides counseling services. Falvey and Alexander handle the business administration and operation. Removing primary care and preventative care out from under the umbrella of health insurance allows these essential services to be provided at more affordable prices, Alexander said. Providers also are able to spend more time with patients because they spend less time on insurance-related duties. As a certified Rural Health Clinic located in a Medically Underserved Area, Orchid Clinic also benefits from federal incentives for accepting Medicare and Medicaid patients. Recruiting staff to a rural area and an unproven model wasn’t as difficult as some might assume. “We knew recruitment to a rural area would be one of our biggest challenges but our model could be one of our biggest advantages,” Falvey added. When word spread that Falvey and Alexander were looking for a site, Oakridge Pharmacy owner Laurie Pattie encouraged them to locate there. The men’s research showed that Lane County Health Department and Social Services had looked at extending care to Oakridge but decided it wouldn’t be sustainable. Estimates from the Oregon Office of Rural Health indicated that over two-thirds of necessary medical visits in Oakridge were unfulfilled. Roughly one-half of Oakridge’s total population was not being served. Estimates about unserved populations didn’t even include Medicaid, Medicare and uninsured patients who weren’t receiving services at all. In Lane County, about 95,000 residents are on the Oregon Health Plan (Medicaid). Ninety percent of Oakridge residents said they were unsatisfied with local healthcare service availability, according to a survey Alexander and Falvey administered. Travel time to medical clinics in other locations is a minimum of 45 minutes. The students-turned-entrepreneurs knew they had their location. They raised over $240,000 in start-up funds, including a loan from the City of Oakridge to refurbish an existing building for the clinic, and $70,000 from Lane County lottery funds. When they first began their student project, both men said they knew they wanted to focus on a social issue and both were interested in healthcare. Falvey grew up in a small Alaska town where access to services was very limited. As a boy, Oregon native Alexander watched his father successfully battle with cancer, and then in high school, he participated in a project redistributing medical waste and supplies to Third World countries. Three times this year, the Orchid Clinic model has won recognition in Oregon: grand prize in the University of Oregon Civil War Shark Tank business competition, first prize in the concept stage competition at the Willamette Angel Conference, and people’s choice at the Portland State University Elevating Impact Summit. Alexander said the Angel Conference is one of the state’s largest business events, putting time and money into promising start-up companies. Receiving the awards has opened doors to broader funding opportunities and approaches from other major seed funders. Oakridge is just the pilot site. These men plan to keep growing their concept in other rural Oregon towns. They’ve just begun. This entry was posted in Around the Country and tagged Clinics, Healthcare business and finance, Oregon, Primary care, Reimbursement and payment models, Rural Health Clinics on November 18, 2014 by Rural Health Information Hub.